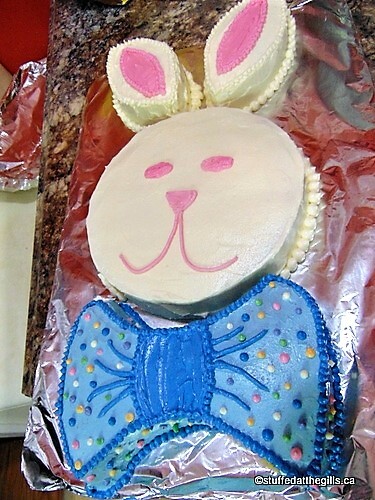 Here's an Easter Cake the kid's will love and it's so easy to put together. It wasn't too long after the move, Cheryl's mother, Mrs. Girdauckis came for a visit to see where that son-in-law of hers had taken her daughter and grandchildren. She was here for only a few weeks and that was when I met Cheryl's mother and sadly it was the only time. A few years later she passed away much too young. 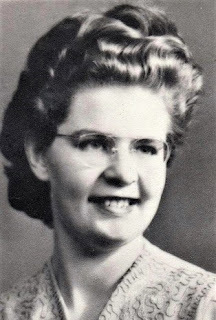 It was so long ago, and it was only those few weeks she was here, that I barely remember what she looked like but Cheryl speaks of her mother often and keeps her memory fresh in my mind. 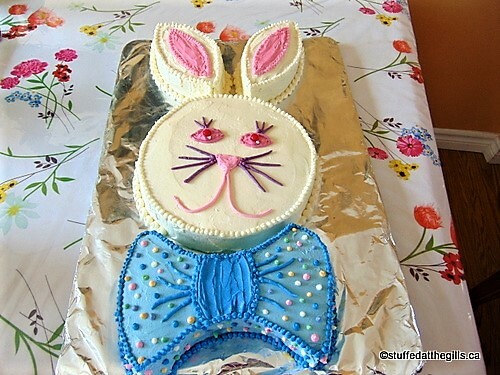 It was just a few weeks ago when Cheryl and I were messaging each other that she sent me a copy of the Bunny Cake. It was a clipping her mother had cut from the Brooks Bulletin (newspaper) that Cheryl had found in a box of her mom's belongings. She was wondering if her mom had ever made the cake for any of the grandchildren. 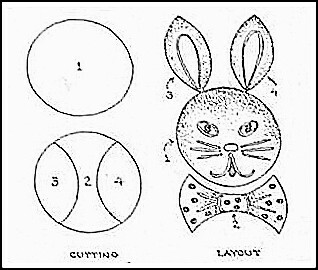 I'd seen this pattern before and think I even had it at one time but I'd never made it. So I suggested I make the cake for my blog so everyone in the Richards and Girdauckis families could have a look at the pattern and cake. After all, Stuffed At the Gill's is a blog of family recipes and sometimes friends are as close as family! I know how dear and special it is to find something your mother had touched. I have a manila envelope stuffed full of recipes mom wrote out or cut from magazines. I never get tired of looking and reading through those scraps of paper. It's like touching part of her. 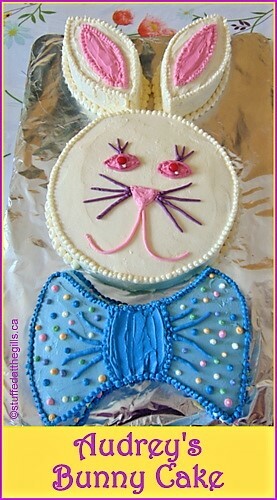 This is a great cake to make with the kids for Easter. It takes two 8- or 9-inch round cakes, some white frosting, food colouring and a few jelly beans or candy. I used a piping bag and round tips for the whiskers and to outline the inside of the ears and all around the bottom and top of the cake but that would be optional. You'll also need a cake board or large platter at least 22x11-inches. I could have had an extra couple of inches on the board I used. You may use any flavour cake. 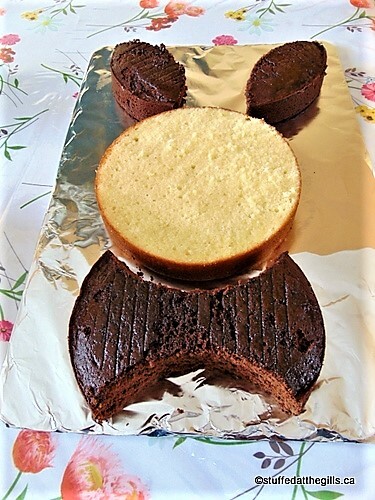 I used one layer Chocolate Chiffon Cake and one layer Vanilla Hot Milk Sponge Cake. If you freeze the layers before cutting it will be easier to make the cuts. 1. Head, 2. Bow Tie, 3&4. Ears. 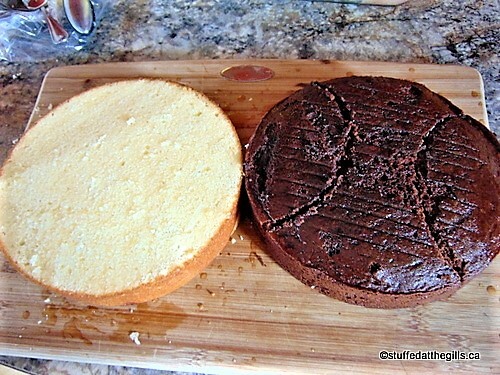 Using the diagram on the right, cut the cakes as shown and arrange on the cake board. 1. Head, 2. Bow Tie, 3&4. Ears. 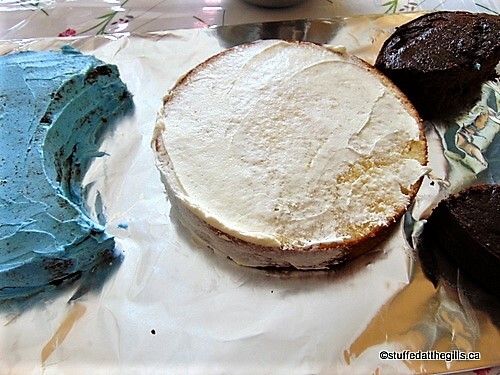 Cover all parts of the cake with a thin layer of frosting to crumb coat the cake. Let dry or refrigerate 30 minutes to set the crumb coat. Frost the head and ears white. Using food colouring, colour a small amount, about ¼ cup, pink. Frost the inside of the ears pink. Use the remaining pink frosting to pipe on the mouth and nose if not using a candy. Chose a colour for the whiskers and pipe them coming from the sides of the nose. I also put a few above the eyes. Instead of piping the whiskers use licorice strings. Colour about 1-1½ cups frosting whatever colour you'd like for the bow tie. I chose blue but any bright spring colour will look nice. If you wish you may highlight the knot and gathers with a contrasting or darker colour. 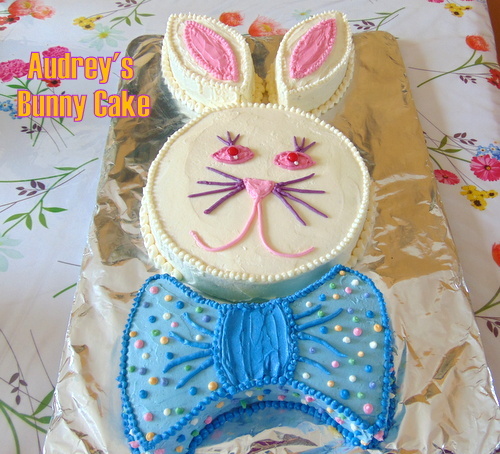 You may also make polka dots with candy or dots of frosting. 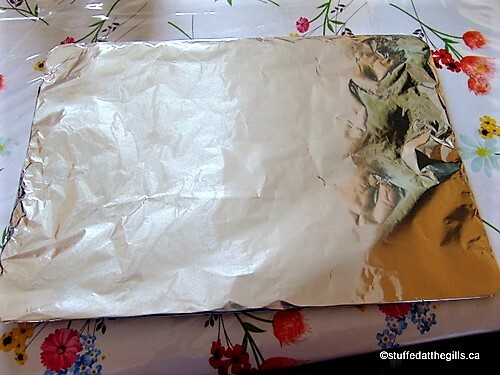 I used heavy cardboard covered with foil wrap for my cake board. I sliced the top off the vanilla cake so it would be level with the chocolate layer. I chose the chocolate layer for the ears and bow tie. Lay the pieces out on the cake board. They don't have to completely touch each other. I moved the piece apart so it would be easier to put on the first layer of frosting or the crumb coat. If you are using chocolate cake it is especially important to crumb cost the cake as those pesky chocolate crumbs just don't want to stay covered. Let the crumb coat set for 30 minutes before giving the cake the final coat of frosting. Push the crumb coated pieces together and frost the head and ears white. Frost the middle of the ears pink and pipe on the mouth and nose. I also used pink for the eyes. 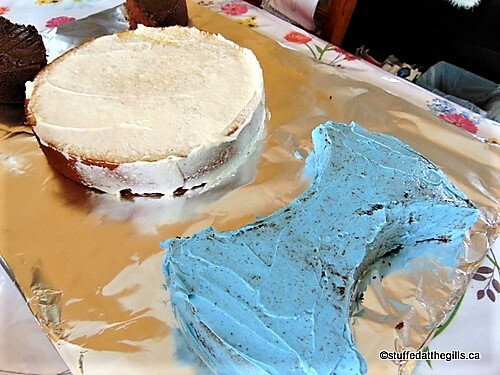 I used blue frosting for the bow ties and a deeper blue to outline the knot and gathers. I also outlined the tie with the darker blue. I gave Mr. Bunny purple whiskers and red cinnamon candy pupils with a little glint of white. I used the left over frostings to make polka dots on the tie. Then as I had more white frosting left, I outlined the top and bottom of the ears and head. I couldn't reach between the tie and the head with the piping bag so that's the only place without an outline. Here's a cute little bunny to gobble up.